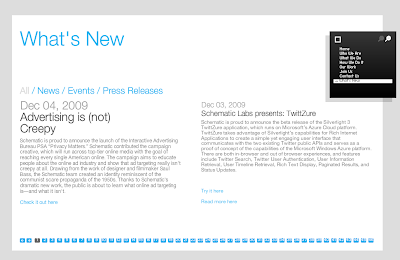 I'm very proud to announce that TwittZure is being showcased at Schematic.com web site. 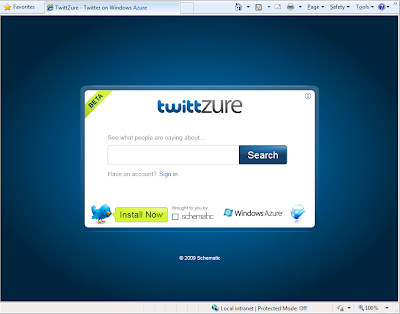 TwittZure stated as my little pet project to explore and gain expertise working with Twitter REST APIs and integrating the REST web services with the Windows Azure cloud and a Silverlight 3 platforms. I submitted the project idea to Schematic R&D department and it was approved. After that, with the help of a designer and an animator, we created a beautiful and engaging user interface and implemented an ASP.NET bridge to take advantages of the Windows Azure cloud server’s high availability and scalability. The application and the middle ASP.NET bridge are being hosted in Windows Azure. Additionally, the application provides in browser and out of browser experiences thanks to the Silverlight 3 out of browser capabilities. The application is a work in progress and we will be enhancing the application by adding more Twitter features and taking advantages of new Silverlight and Windows Azure features as time allows. Stay tuned for more news about TwittZure.